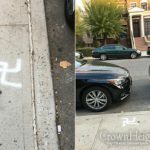 On Friday afternoon a number of residents in a Crown Heights apartment building discovered that swastikas have been drawn on the doors to their apartments. The police have opened a hate crimes investigation. 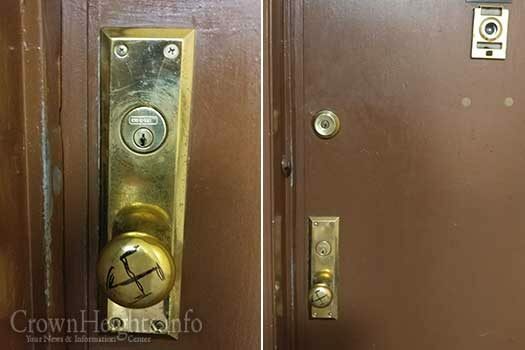 On Friday afternoon, just a short while before Shabbos was to begin, Jewish residents of 415 Lefferts Avenue, just across the Beth Rivkah Schools, discovered that swastikas have been drawn on the doors to their apartments. 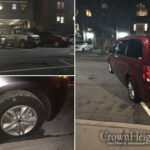 In total three doors were targeted, all of those apartments belong to Jewish residents who make up a minority of the buildings residents. 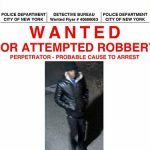 The incident was reported to Crown Heights Shomrim who in turn notified the police department which began an investigation as a hate crime. Surprising that police are considering it a hate crime. I though in america nowadays hate crimes can only be perpetrated against one denomination. Where could you possibly have got such an ignorant and uninformed thought? Nothing in the real world could possibly have given you that impression. Yes I’m happy we moved and no longer live in fear. Alarmed houses, locked steering wheels and fearful to go out at night no longer part of our lives. But I still have family in NY. One politician is as bad as another. It’s tragic and when will it end. How about when NY changes its gun laws and we can defend ourselves!